Michael L. Kirkindoll is Coordinator of the Atlanta Campus of Brenau University, Atlanta, Georgia. - Publisher This book is printed On Demand and available from Ingram. Hospital visitation is one of the most intimidating tasks new clergy face. Afraid of not knowing what to say when faced with situations of serious illness and death, uncertain of how to negotiate the maze of the medical establishment, unsure of themselves in the pastoral role generally, new pastors often don't know where to turn for help and advice about this central, yet tough, aspect of ministry. 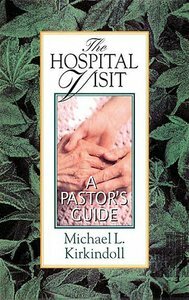 The Hospital Visit: A Pastor's Guide will help provide just this kind of guidance.Written with student pastors and pastors in the early years of their ministry in mind, it will explore the key situations all pastors encounter in hospital visitation. Beginning with the idea that pastoral care in the hospital setting consists of "Trialogue" between the pastor, the patient, and the presence of God, Michael L. Kirkindoll will explain the pastor's role in terms of six principal relationships: The pastor's relationship to the patient, to the family, to the local congregation, to the hospital chaplain, to doctors an other medical personnel,and finally, to the pastor's own woundedness. The book will conclude with prayers for the hospital bedside which the author has used in his own ministry, and which he has gathered from other experienced pastoral caregivers. This book is printed On Demand and available from Ingram. Hospital visitation is one of the most intimidating tasks new clergy face. Afraid of not knowing what to say when faced with situations of serious illness and death, uncertain of how to negotiate the maze of the medical establishment, unsure of themselves in the pastoral role generally, new pastors often don't know where to turn for help and advice about this central, yet tough, aspect of ministry. The Hospital Visit: A Pastor's Guide will help provide just this kind of guidance. Written with student pastors and pastors in the early years of their ministry in mind, it will explore the key situations all pastors encounter in hospital visitation. Beginning with the idea that pastoral care in the hospital setting consists of "Trialogue" between the pastor, the patient, and the presence of God, Michael L. Kirkindoll will explain the pastor's role in terms of six principal relationships: The pastor's relationship to the patient, to the family, to the local congregation, to the hospital chaplain, to doctors an other medical personnel, and finally, to the pastor's own woundedness. The book will conclude with prayers for the hospital bedside which the author has used in his own ministry, and which he has gathered from other experienced pastoral caregivers. This book is printed On Demand and available from Ingram. Hospital visitation is one of the most intimidating tasks new clergy face. Afraid of not knowing what to say when faced with situations of serious illness and death, uncertain of how to negotiate the maze of the medical establishment, unsure of themselves in the pastoral role generally, new pastors often don't know where to turn for help and advice about this central, yet tough, aspect of ministry. The Hospital Visit: A Pastor's Guide will help provide just this kind of guidance.Written with student pastors and pastors in the early years of their ministry in mind, it will explore the key situations all pastors encounter in hospital visitation. Beginning with the idea that pastoral care in the hospital setting consists of "Trialogue" between the pastor, the patient, and the presence of God, Michael L. Kirkindoll will explain the pastor's role in terms of six principal relationships: The pastor's relationship to the patient, to the family, to the local congregation, to the hospital chaplain, to doctors an other medical personnel,and finally, to the pastor's own woundedness. The book will conclude with prayers for the hospital bedside which the author has used in his own ministry, and which he has gathered from other experienced pastoral caregivers. kirkindoll is pastor of first baptist church, jefferson, georgia.